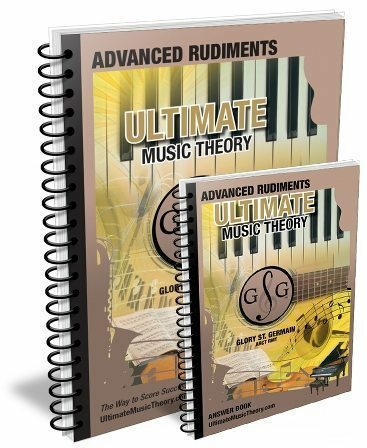 In Advanced Rudiments, students are introduced to Modern Vocal Score (Page 113). Each year, I receive a number of emails from Teachers and Students who just want clarification where Modern Vocal Score Dynamics are placed. Modern Vocal Score Dynamics have specific placement positions as they are intended to be followed by the vocalist. 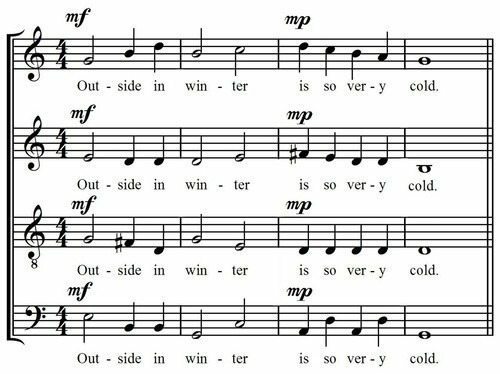 So here are some Ultimate Music Theory Tips to remember how to write Modern Vocal Score Dynamics - with and without lyrics - in Open and in Short Score. Modern Vocal Score is written for four voices - Soprano, Alto, Tenor and Bass. My students remember the required Clefs using this funny saying "In Vocal Score, you have Treble, Treble, Treble ate the Bass" (Treble, Treble, Treble 8, Bass). Okay - so it's not that funny...but it helps them remember the Clefs! In Open Score for Modern Vocal Score, lyrics (the words) are written below each staff line. The lyrics will line up with the melody and rhythm of the voice that is singing them. When there are lyrics included in the Score, the Modern Vocal Score Bar Lines are written on each individual staff (and not completely through the Open Score). This allows for the words to be read (sung) without being hindered by the bar lines. Modern Vocal Score Dynamics should be written above each staff in Open Score. The vocalist must follow the dynamics above the staff and read the lyrics below the staff. Option #1: (Recommended) When words (lyrics) are not included in an excerpt of Modern Vocal Score, it is still preferred that the dynamics be written above each staff. Short Score is also known as Keyboard Score, Condensed Score and Close Score. In Short Score, there are only 2 staves - the Treble Staff (on top) and the Bass Staff (on bottom). The notes for the Soprano Voice are written stems up in the Treble Staff. The notes for the Alto Voice are written stems down in the Treble Staff. The notes for the Tenor Voice are written stems up in the Bass Staff. The notes for the Bass Voice are written stems down in the Bass Staff. In Short Score, the lyrics are written in the middle of the Grand Staff. Modern Vocal Score Bar Lines are written through each individual staff (and not completely through the Grand Staff). Dynamics are written above the Treble Staff for the Soprano and Alto Voices, and above the Bass Staff for the Tenor and Bass Voices. Option #1: (Recommended) The Modern Vocal Score Bar Lines are written on each individual staff. Option #2: (Acceptable) The Modern Vocal Score Bar Lines are written from the top of the Treble Staff straight through to the bottom line of the Bass Staff. Be consistent though - if there will be lyrics eventually in your music, write the Bar Lines on each individual staff throughout the composition (even when there are no lyrics). Option #1: (Recommended) Dynamics are written above the Treble Staff for the Soprano and Alto Voices, and above the Bass Staff for the Tenor and Bass Voices. Option #2: (Acceptable - as shown in the above example) Dynamics are written in the middle of the Grand Staff. 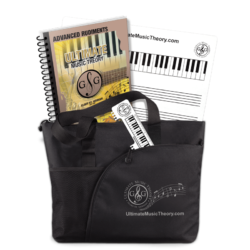 The Ultimate Music Advanced Student Pack contains everything that your Advanced Theory Student will need. 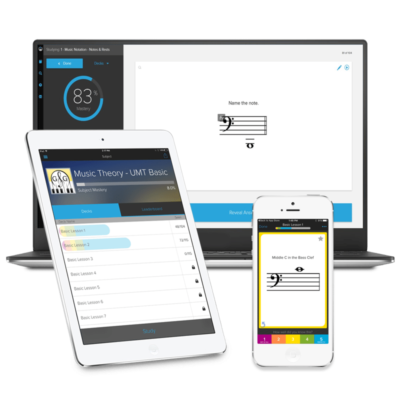 Their Advanced Music Theory Workbook, including the Music Theory Guide and Chart. Their 80 Free Flashcards (be sure they save the Flashcards from Prep 1, Prep 2, Basic and Intermediate Rudiments along with the Advanced Flashcards) to review all their terms, signs and definitions. Their Two Sided Whiteboard including the dry-eraser and dry-erase marker. A versatile UMT Tote Bag to carry everything in.